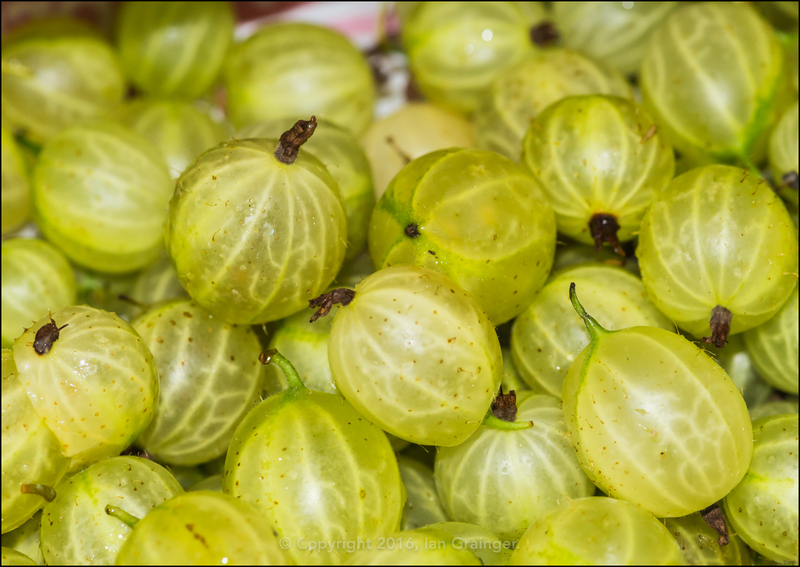 First though, these gooseberries were harvested before the rain arrived, and are fresh from the garden, dirt and all! I thought they'd make a change from my usual flora or fauna Image of the Week, and bring another 'F' to the party in the shape of Fruit. I usually shoot the majority of my weekly article images on a Sunday, but this week it was horrendous, and never stopped raining. 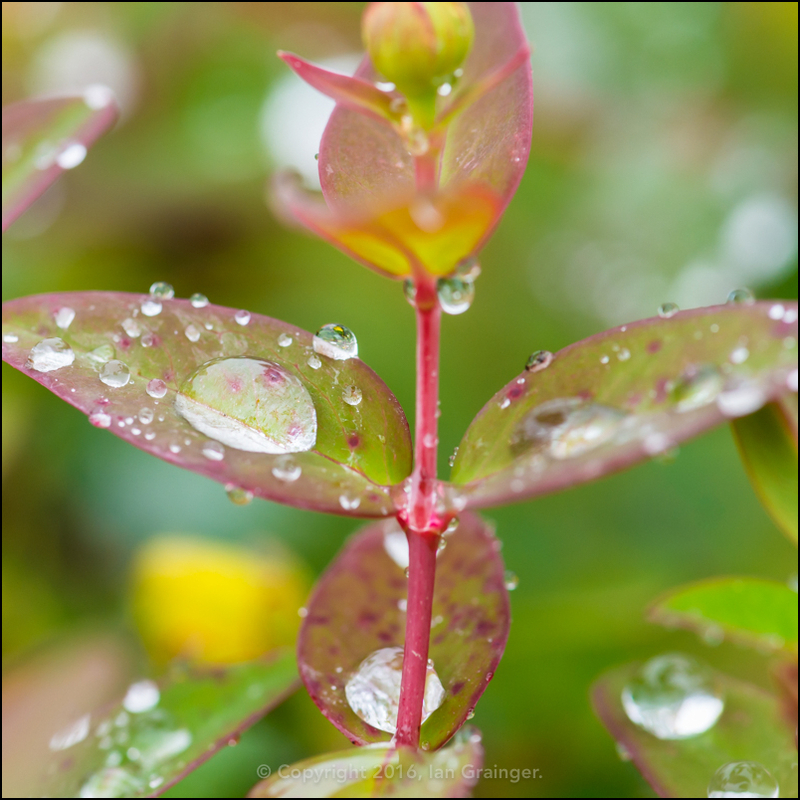 However, not one to shy away from a bit of wet, I endeavoured to bring you a snapshot of my morning photo shoot, where pretty much everything looked like the shrub above. 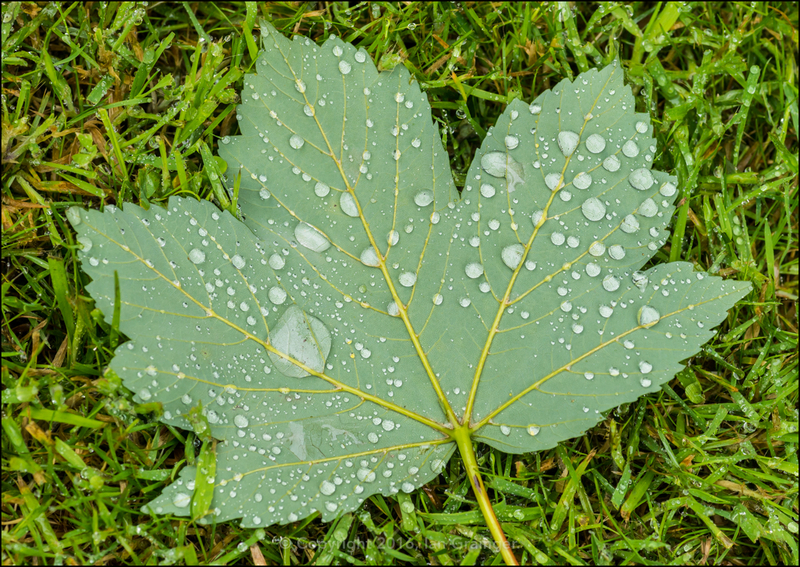 Not only was it wet, but it was also windy, and there were Sycamore tree leaves strewn all across the garden lawn, the wind having prematurely detached them from their branches. 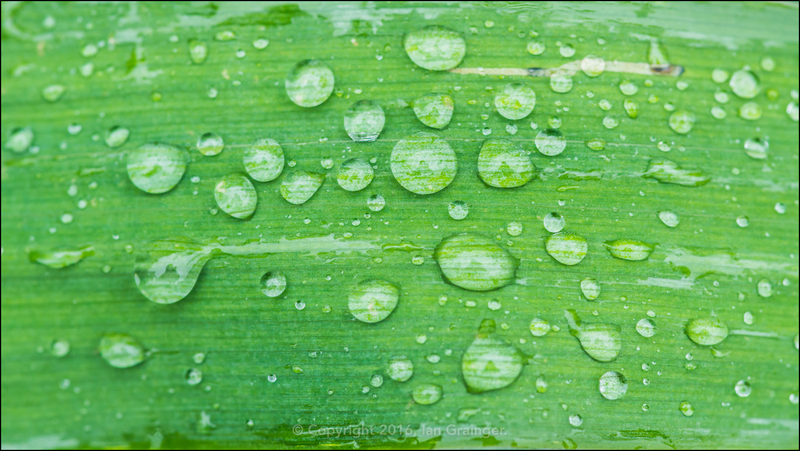 I must admit that raindrops do have the ability to bring interest to the more mundane of subjects, as both the Sycamore leaf and this Flag Iris (Iris pseudacorus) leaf show. 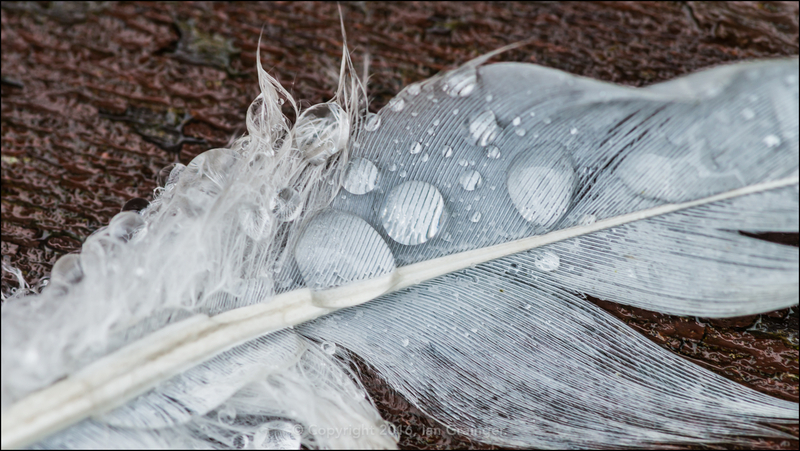 Even this lone white feather looks somewhat artistic with the water drops magnifying the vanes. 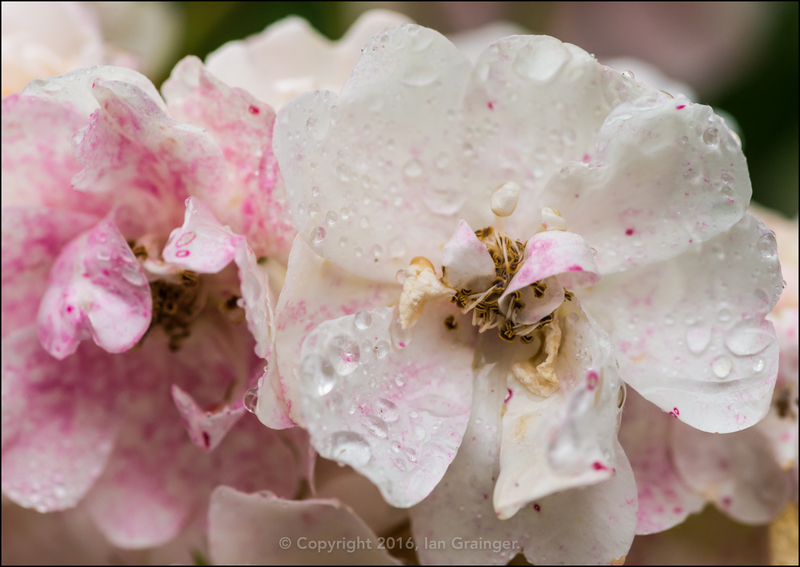 Things really get interesting when raindrops combine with something that is already inherently beautiful. Take this Wild Rose (Rosa) for instance. 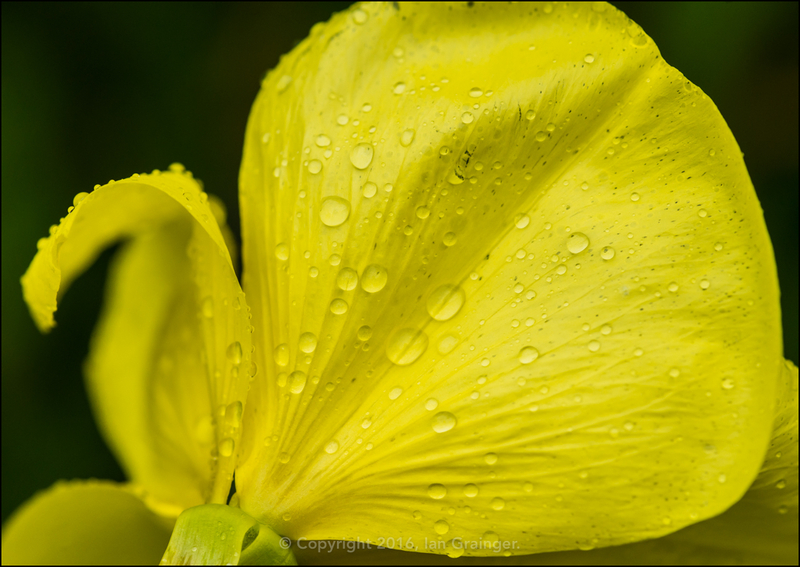 Subjects that can be quite difficult to capture, suddenly become much more interesting, like this Evening Primrose (Oenothera) bloom. 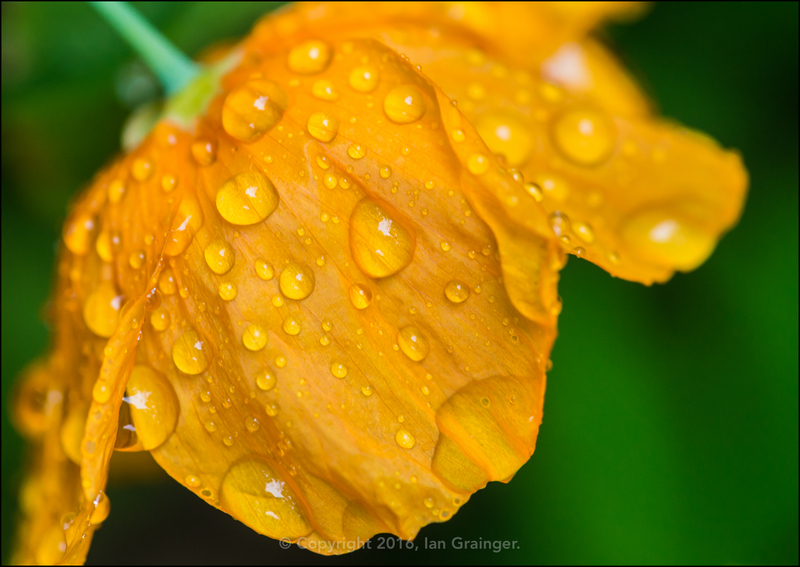 And subjects such as this Welsh Poppy (Meconopsis cambrica) are really enhanced when they get a sprinkling of raindrops. 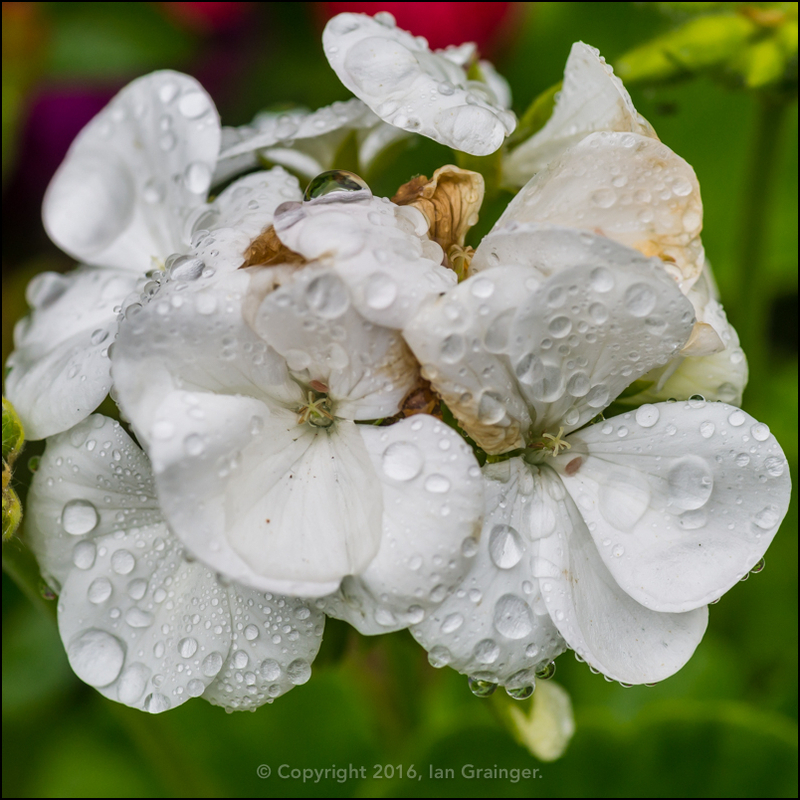 ...although they look just as beautiful on Pelargoniums, but I guess the lyrics just didn't scan quite so well! It's not just pink Pelargoniums they look good on either! 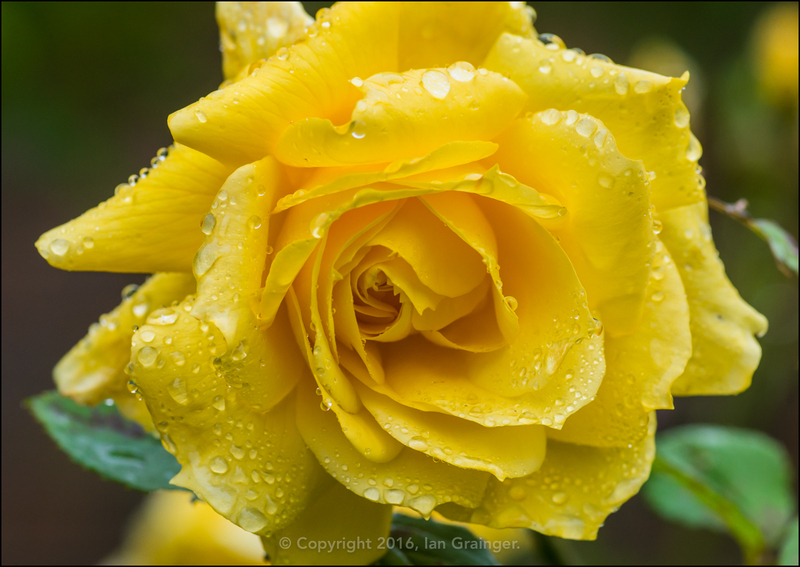 As the rain came down, I soldiered on, wondering if it would dry up before I finished my photo shoot. It didn't! 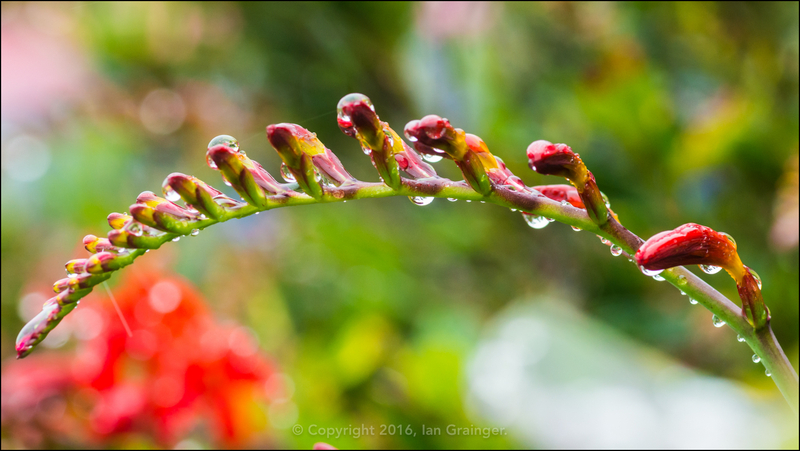 The water dropets seemed to cling to every available surface of these Crocosmia Lucifer flower buds. 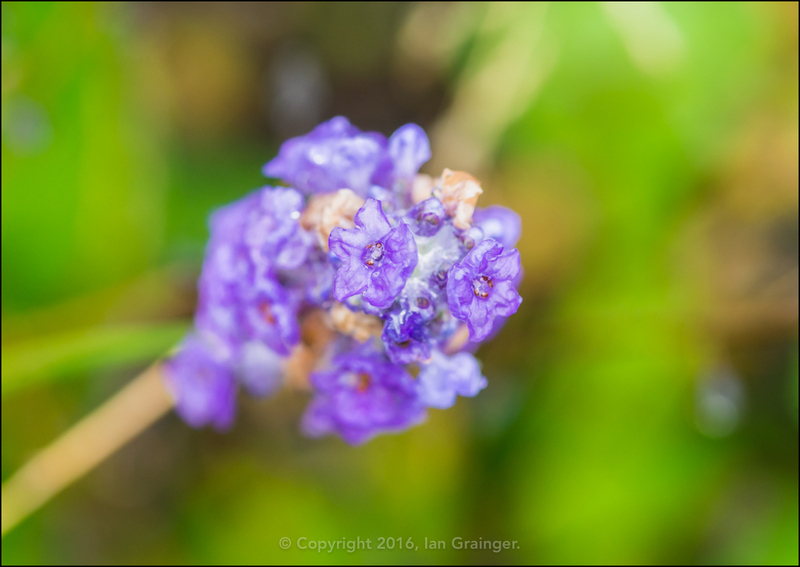 The poor Lavender (Lavandula) had only just opened up, and was getting a proper soaking. Lavender is known for liking hot and dry conditions, so I don't know what it will be making of the weather. 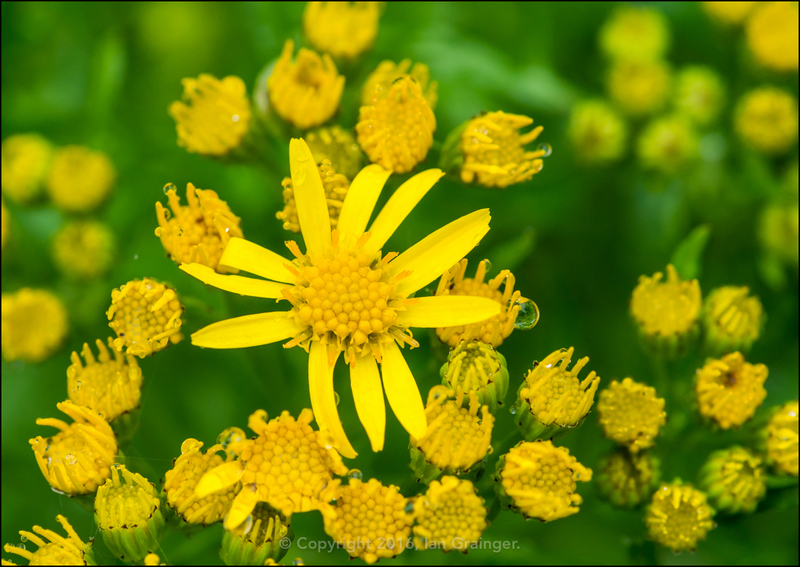 The Ragwort (Senecio) was just starting to open up this week, no doubt spurred on by last week's more summer like weather. Bet it wishes it had stayed closed up! 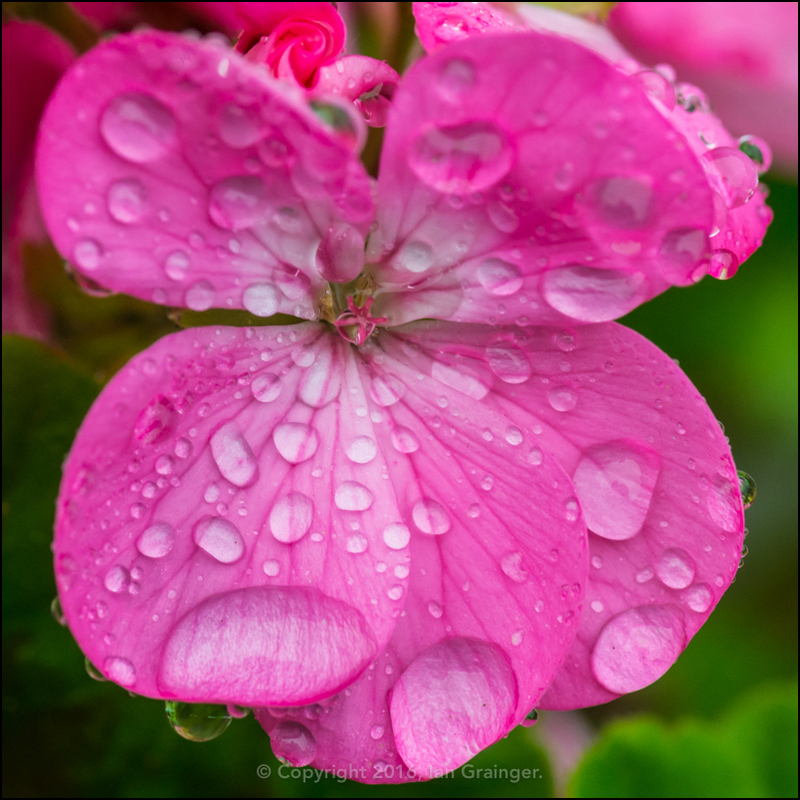 One category of plants that were really enjoying the wet weather were the Hydrangeas. 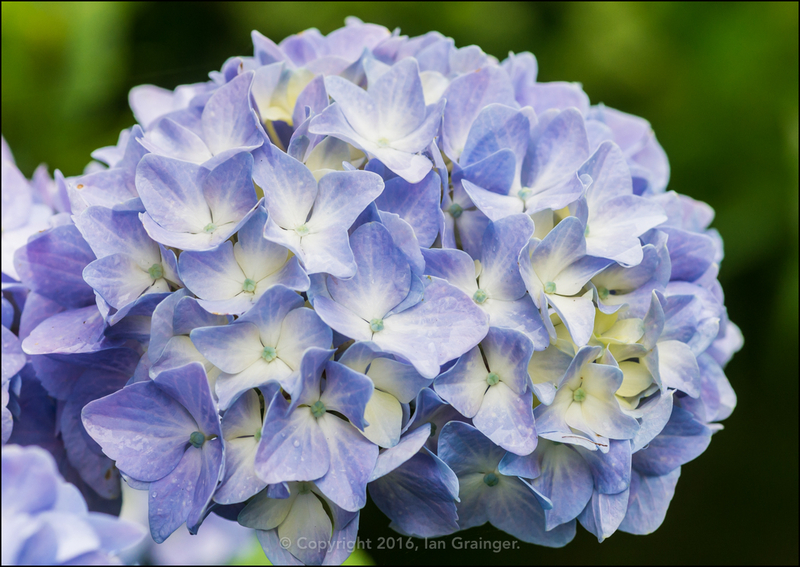 This big blue Mophead Hydrangea was covered in dozens of large bract balls just like this one. 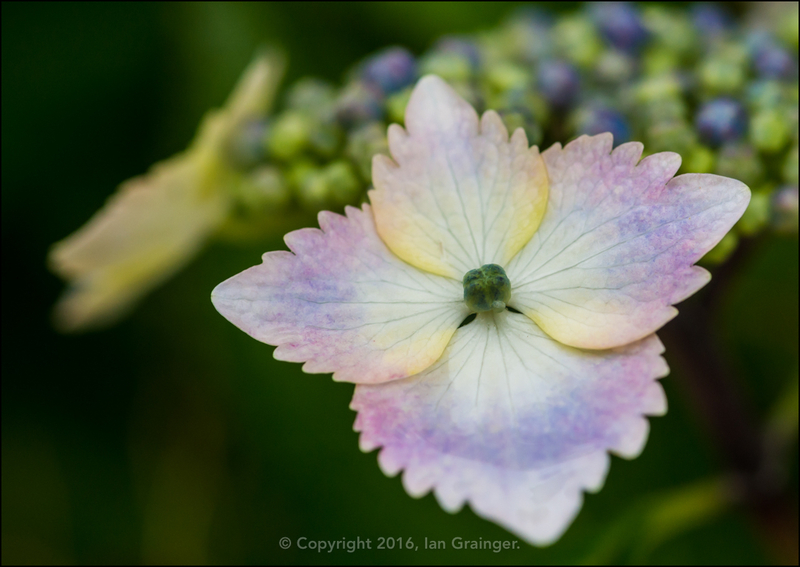 Blue flowers are obtained by planting in acidic soil, while pinker flowers are obtained by planting in alkaline soil. I'm not sure what's going on in dad's garden though, as he has blue and pink hydrangeas side by side, and hasn't done anything with the soil! 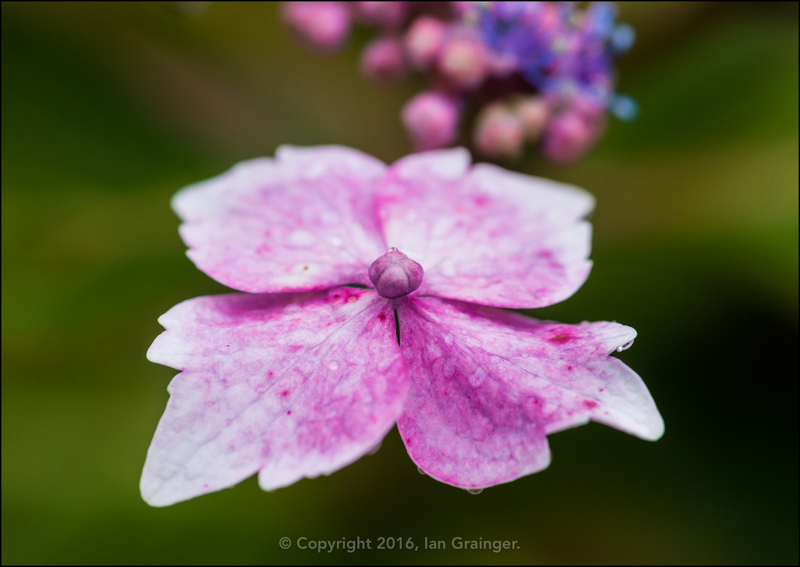 The Lacecap Hydrangeas were also doing very nicely too, and as you can see, this one is pink. Here's another one, from a different, but nearby plant, that doesn't seem to have made up its mind yet. I finally had to admit defeat, as the rain came down ever heavier, and ended up indoors, surveying the house plants. 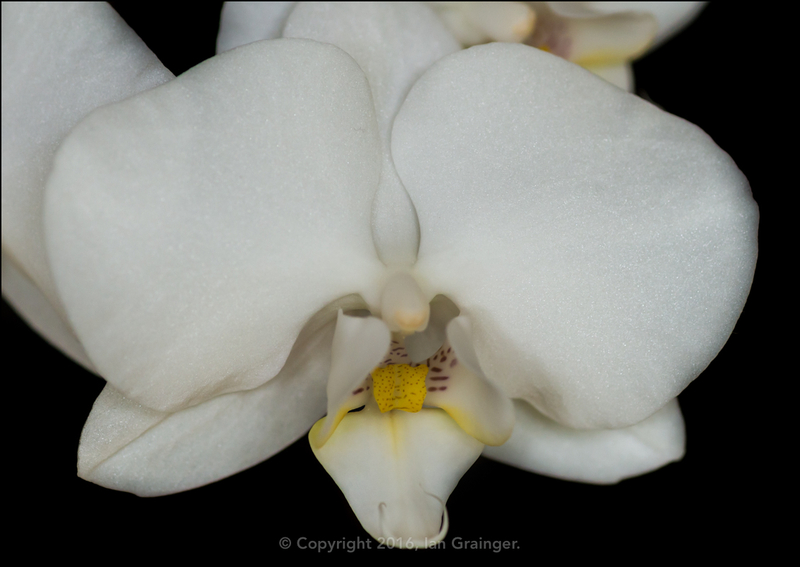 This Moth Orchid (Phalaenopsis) has been putting on a beautiful display after reverting to its white colouring this year. It had originally been dyed blue when first purchased, but looks much better in its natural colour. 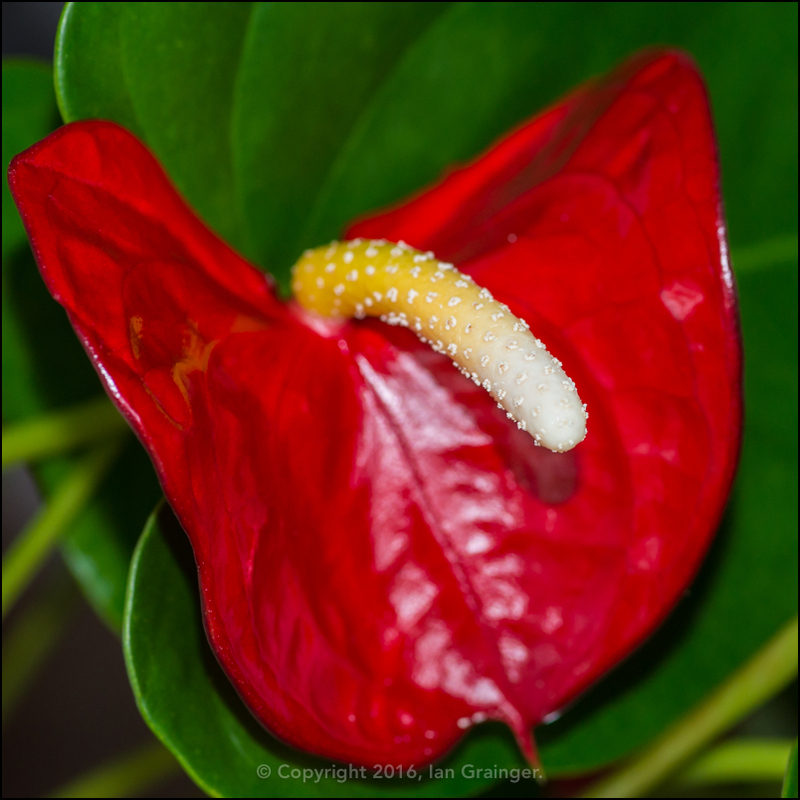 This is the second year of flowering for this Anthurium, which I first posted about in this article last year. It has only gone without flowers for a few weeks in the past 18 months, which I find quite remarkable. 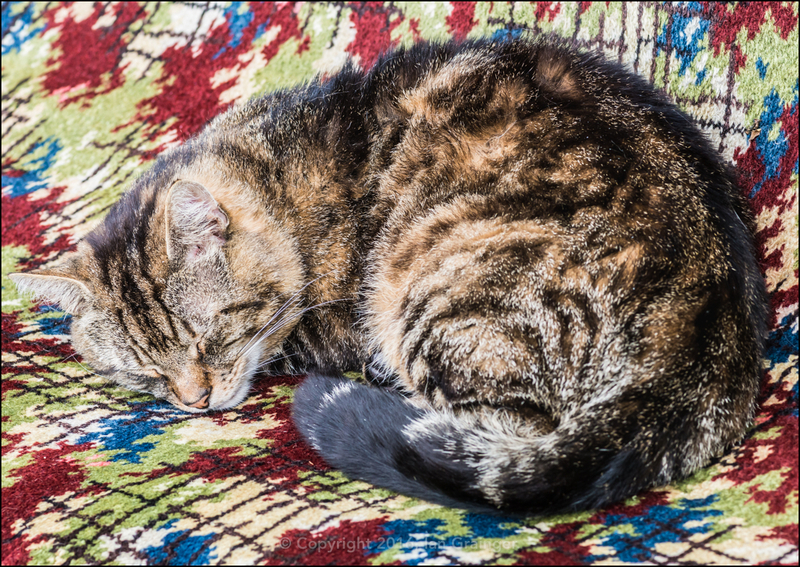 With all of the wind and rain, I couldn't persuade my furry friend to join me in the garden, so here's a shot of him enjoying his favourite carpet, partaking in his favourite pastime a couple of weeks ago. So, what's been going on in my own garden? 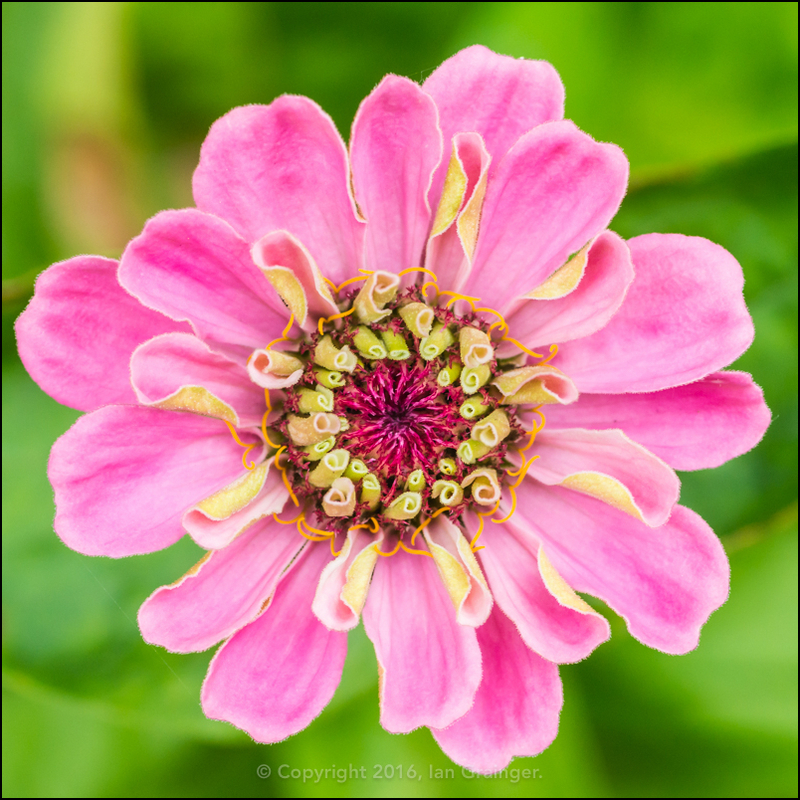 Well, my first Zinnias have begun flowering. I sowed these as seeds back in April, and they're now putting on a fine display. 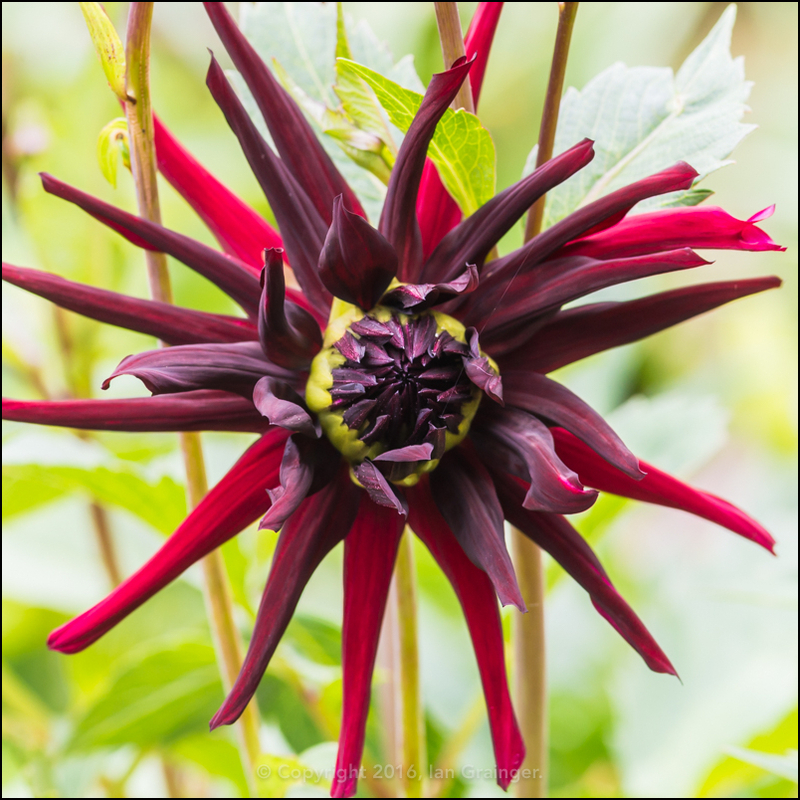 The star of my garden at the moment is this Dahlia Nuit D'Ete, which I believe translates to Dahlia Summer Night. At over a metre in height, and covered in flower buds, it is going to be stunning. 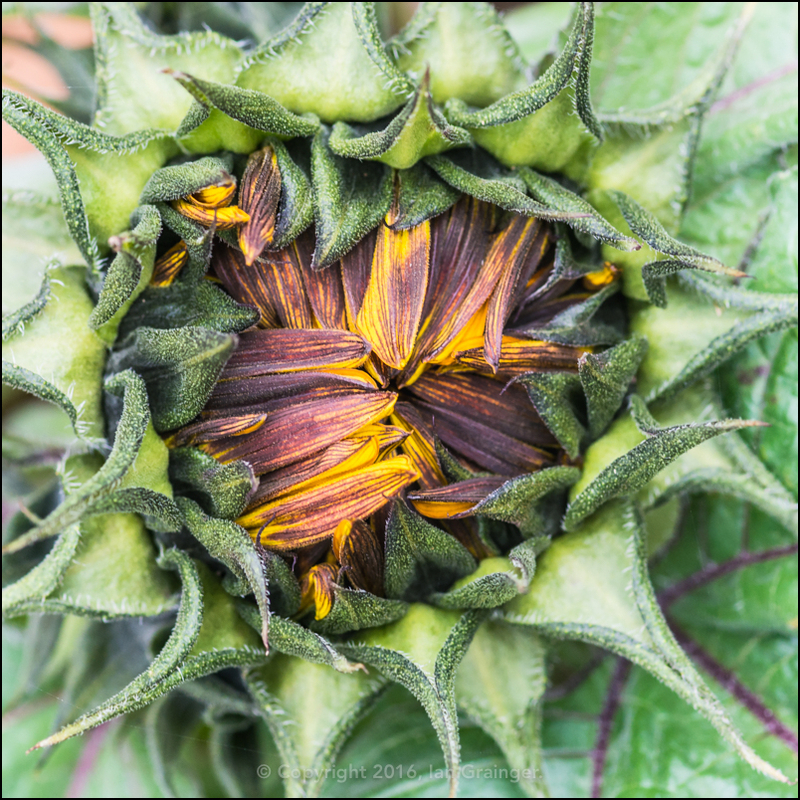 It won't be long either until my garden is full of dwarf Sunflowers (Helianthus), also grown from seed at the same time as the Zinnias. 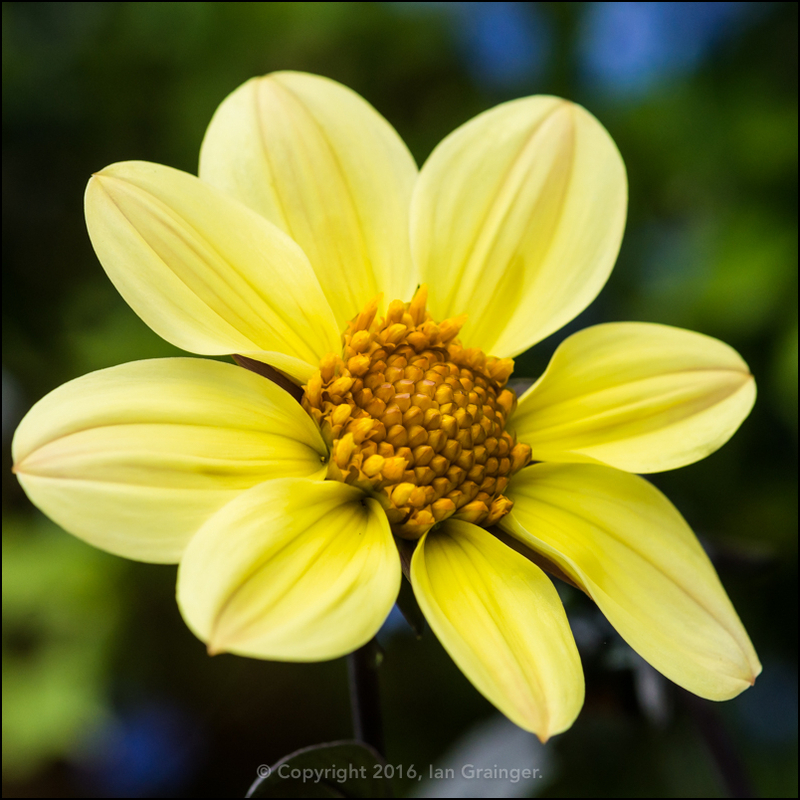 I rescued this Dahlia 'Happy Days' from the garden centre. It had been wind damaged, and was on sale for £2.50. I couldn't resist trying to save it, and after a quick trim to remove the broken stems, it's now sending up lots of new flower buds, and should continue to do so all summer long if I keep dead heading it. 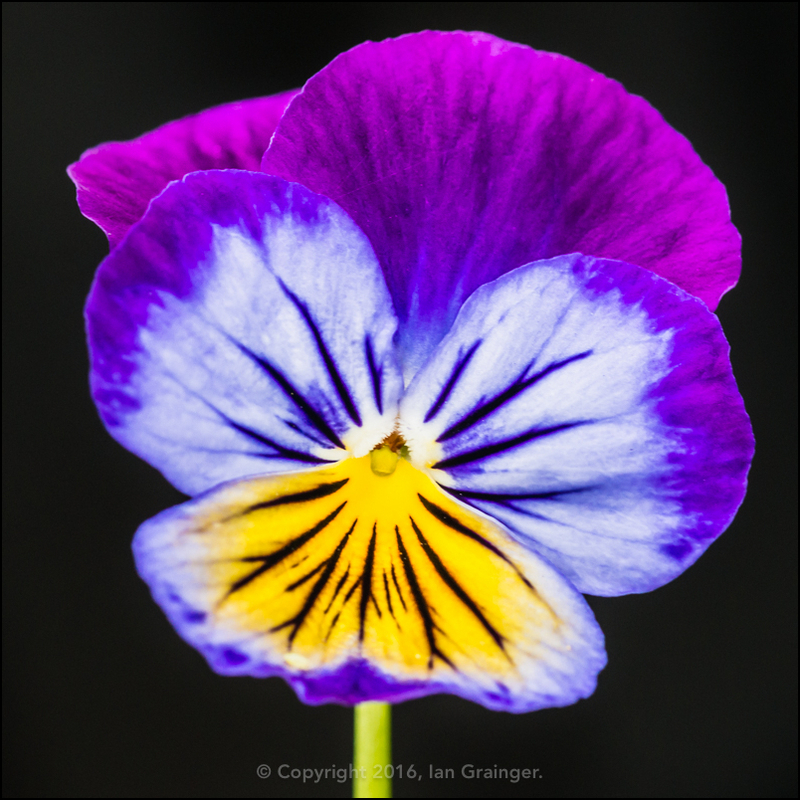 Finally, probably the prettiest flower in my garden at the moment is this multi-coloured Pansy (Viola tricolor). I'm particularly pleased how good it looks against my garden shed, which I've recently painted black.